Walker & Dunlop, Inc. announced today that it provided short-term bridge financing for the acquisition of Castile Apartments, and then later converted the financing to a $56,500,000 permanent Freddie Mac loan. Led by Managing Director Trevor Fase, the team successfully closed both complex transactions on a compressed timeline for the borrower, Thompson Michie Equities (TME). The property is a Class A+, lakeside garden-style apartment community located just outside of Las Vegas, in Henderson, Nevada. Within a month of the initial bridge financing, Walker & Dunlop’s team leveraged its deep understanding of Freddie Mac’s programs to close a Lease-Up loan for the borrower. Completed in early 2018, the property is nearing full occupancy; the Lease-Up program allows borrowers to lock and close prior to stabilization. The financing was structured as an 11-year fixed rate loan, with full-term interest-only. The team ensured an excellent rate for the borrower by taking advantage of Freddie Mac’s Index Lock program, capitalizing on low Treasury rates early in the due diligence process. Completed in 2018, Castile Apartments consists of 28 buildings and 498 units. The property’s unit mix comprises studios, one-, two-, and three-bedrooms, as well as carriage-houses. With optional balconies, all-new interiors, appliances, and finishes, Castile Apartments is the latest delivery in the immediate area. 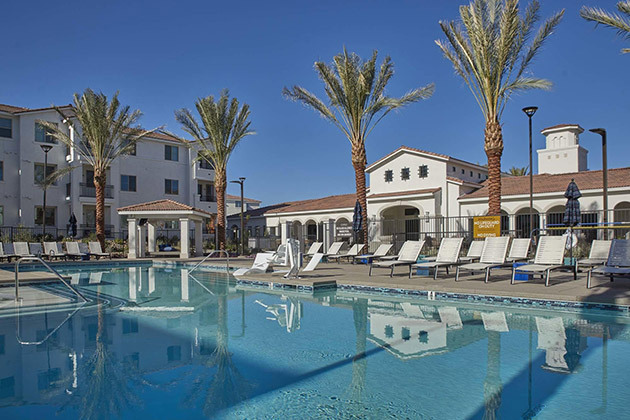 The community also features a premium amenities package including a gated entrance, pool, spa, clubhouse, yoga and spinning studios, fitness center, business center, media lounge with TV, barbecue and picnic areas, and a dog park.